Neva Mae Johnson, age 87, of Alliance, passed away at 9:10 a.m., Thursday, March 1, 2018, at Aultman Compassionate Care Center in Canton. She was born October 5, 1930 in Putnam County, West Virginia, to John and Zilpha (Gillispie) Frazier. Neva was formerly employed as a seamstress at Sherwood Manufacturing for more than 24 years. 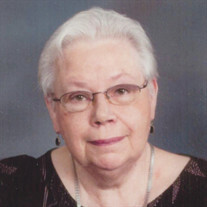 She was a member of Union Avenue United Methodist Church and loved to cook, sew and tend to her flower gardens. Survivors include her son, Walter F. Johnson III of Columbus; daughter, Diane K. Alge of Canton; brothers, Jerry Frazier of Georgia, and Jim Frazier, of West Virginia; and sisters, Myrna Murray of Florida, Judy Abel of Maryland and Helen Behrman of West Virginia; six grandchildren and eight great-grandchildren; and three great-great grandchildren. Neva was preceded in death by her parents; husband, Walter Johnson, whom she married February 21, 1948; son, John J. Johnson; and brothers, John Frazier and Jack Frazier. Services will be held at 1:30 p.m., Tuesday, March 6, 2018, at Union Avenue United Methodist Church with whom Rev. Coralee Cox officiating. Friends may call from noon to 1:30 p.m. at the church. Interment will be at Highland Memorial Park. Neva's wishes were to make memorial contributions to Union Avenue United Methodist Church 1843 S. Union Ave. Alliance, OH 44601.